Imagine a nefarious group of people that wanted to do as much harm as possible to the employment prospects of those with limited education and work experience. What scheme would they concoct? Probably this devious plan: Increase the national minimum wage from the current $7.25 an hour to $15.00 an hour. By raising the price of hiring those at the lower end of the economy, a higher minimum wage would be an effective way to keep many of them out of the working world. Raise the minimum wage to $15.00 an hour and some lucky people’s wages would go up, but many more people would lose their jobs, or – less visibly – would never get a job in the first place. Those at the bottom of the economy – the unskilled, the inexperienced, the high school drop-out trying to get his life back on track, the single parent getting into the workforce – do not yet have much to offer an employer. Their unskilled and inexperienced efforts may be worth something to a business, but probably not $15.00 an hour. An employer is only going to employ someone whose work is as valuable as the wage paid. Remember that for the vast majority of minimum wage workers, that job is just the beginning, the first rung of the ladder. That first job gives them the chance to develop good work habits and skills and to gain experience. Then their value to employers increases. Then their wages go up. For the unskilled and inexperienced, the first job, the first step on the ladder, is often the hardest to find, but it is also the most vital. 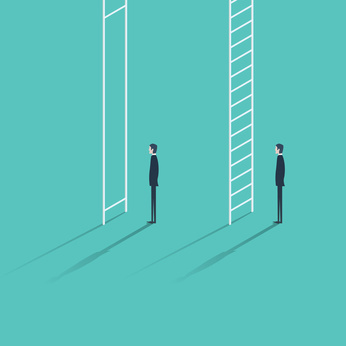 If the first rung on the ladder, though, is out of reach – if the price to hire them is made higher than the value they can bring to the job – they won’t get hired. Raising the minimum wage to $15.00 an hour places that first rung far too high. Picture Jane Worker, a young woman, poor, just beginning her working life. She is ready to offer her labor to employers, but her skills are limited. After all, she’s just starting out. She doesn’t like the pay much, but she lands her first job at the current minimum wage of $7.25 an hour. But as Jane works she acquires skills and good work habits and knowledge. Her services become more valuable. She begins to oversee others, to take on more responsibility, to produce more and better things. Her wages go up to $8.00 an hour, then $10.00, then $12.00, then $15.00, then $19.00. Maybe she eventually becomes a partner in the business and shares the profits, or maybe she starts her own business. She started at the bottom rung of the ladder, and she gradually climbed up the ladder as she became more productive. What if the minimum wage had been $15.00 an hour when Jane started? That changes her prospects. Jane’s work was not yet worth $15.00 an hour. At that point she could produce only $7.00-$8.00 worth of value per hour. The employer that hired Jane at $15.00 an hour would be losing money. So Jane would probably not have been hired. Wishful thinking does not change the fact that no business will last long paying $15.00 for $7.25 of productivity. Raise wages to $15.00 an hour, and businesses will try to adjust. Some business will hire fewer but more experienced, productive workers, ones who are already worth $15.00 an hour. Some businesses will automate more, replacing workers with machinery. Some businesses won’t be able to adjust and will shut down. In any case, workers like Jane, the inexperienced, the young, the less skilled, those not yet worth that minimum wage, get hired less often. Jane and others like her can’t start the process of moving up the economic ladder, because the first rung has been taken away by the higher minimum wage law. The answer: He probably can’t live on $7.25 an hour. The single parent will need help from family and friends, and perhaps also from the government through welfare assistance and Earned Income Tax Credits. But again, wishful thinking will not change the fact that an employer is not going to pay $15.00 an hour for work that is not worth $15.00 an hour, even if the worker is a single parent. Raising the minimum wage to $15.00 an hour sounds wonderful. It has that “helping the less fortunate” ring to it. In fact, it would hurt those at the bottom of the economy. It would make it more difficult for them to land a job, especially the all-important first job that launches them into the working world. Raising the minimum wage is a temptation, but don’t be fooled. It would hurt the very people it is intended to help.